The trace route output shows the ip address configured on the loopback interfaces of the core routers. If the loopback is disabled the trace route will be broken because the router will then use the LLA to reply and it will not get out of the broadcast domain. To simulate this we disable the loopback of R2 and then trace the route. The 3rd hop which is R2 did answer the TTL exceeded message but it did not reach H1 as it is originated from LLA. The same thing will happen with packets which want to transit and have a larger MTU. As in IPv6 router on the transit path does not fragment a packet, it will send a “Packet too big” message to the source. This will be also sent from the Global address. Let’s now change the interface MTU to 1300 and send a ping from H1 to H4 with a larger packet size. Host H1 will never be able to transverse R2, if it sends packets larger than 1300 bytes. 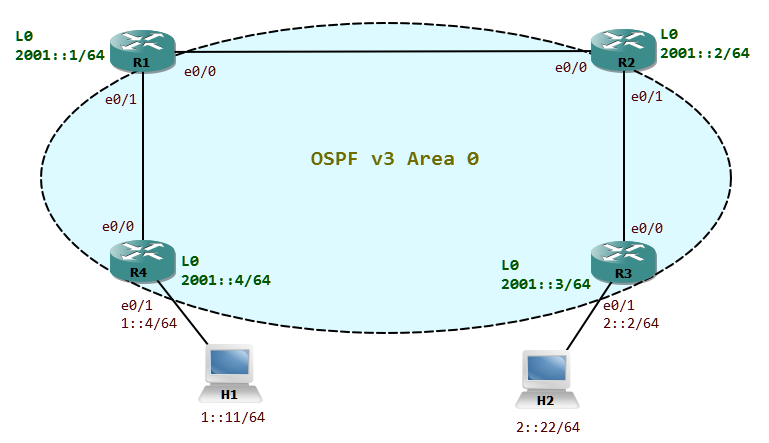 An IPv6 router needs an address other than LLA; either global or unique local if it has to be administered outside the local broadcast domain.